We wish to acknowledge Prof. Luis Claudio S. Thuler, for his valuable collaboration in the management of our database. Utility standards: the evaluation will serve the information needs of intended users. U1 – Stakeholder identification. The individuals involved in or affected by the evaluation should be identified so that their needs can be addressed. U4 – Values identification. The perspectives, procedures, and rationale used to interpret the findings should be carefully described so that the bases for value judgments are clear. U7 – Evaluation impact. Evaluations should be planned, conducted, and reported in ways that encourage the follow-through by stakeholders to increase the likelihood of the evaluation being used. Feasibility standards: the evaluation will be realistic, prudent, diplomatic, and frugal. F2 – Political viability. During planning and conduct of the evaluation, consideration should be given to the varied positions of interest groups so that their cooperation can be obtained and possible attempts by any group to curtail evaluation operations or to bias or misapply the results can be averted or counteracted. Propriety standards: the evaluation will be conducted legally, ethically, and with regard to the welfare of those involved in the evaluation, as well as those affected by its results. P1 – Service orientation. The evaluation should be designed to assist organizations in addressing and serving effectively the needs of the targeted participants. P5 – Complete and fair assessment. The evaluation should be complete and fair in its examination and recording of strengths and weaknesses of the program so that strengths can be enhanced and problem areas addressed. P6 – Disclosure of findings. The principal parties to an evaluation should ensure that the full evaluation findings with pertinent limitations are made accessible to the persons affected by the evaluation and any others with expressed legal rights to receive the results. Accuracy standards: the evaluation will convey technically adequate information regarding the determining features of merit of the program. A1 – Program documentation. The program being evaluated should be documented clearly and accurately. A2 – Context analysis. The context in which the program exists should be examined in enough detail to identify probable influences on the program. A3 – Described purposes and procedures. The purposes and procedures of the evaluation should be monitored and described in enough detail to identify and assess them. A4 – Defensible information sources. Sources of information used in a program evaluation should be described in enough detail to assess the adequacy of the information. A5 – Valid information. Information-gathering procedures should be developed and implemented to ensure a valid interpretation for the intended use. A6 – Reliable information. Information-gathering procedures should be developed and implemented to ensure sufficiently reliable information for the intended use. A7 – Systematic information. Information collected, processed, and reported in an evaluation should be systematically reviewed and any errors corrected. A8 + A9 – Data analysis. Information should be analyzed appropriately and systematically so that evaluation questions are answered effectively. A10 – Justified conclusions. Conclusions reached should be explicitly justified for stakeholders’ assessment. Specificity standards: the evaluation was theorized in accordance with community-based health promotion principles. S1 – Theory or mechanisms of change. The evaluation discloses the theory or mechanisms of change in a clear fashion (logic model of the evaluation). S2 – Community capacity-building. The evaluation adheres to empowerment and community capacity-building principles (“participatory users”). S3 – Multi-strategy evaluation. The evaluation combined quantitative and qualitative analyses that made appropriate links between theory & methods and process & outcomes measures. S4 – Accountability. The evaluation provided information regarding community (stakeholder) accountability. S5 – Effective practices. The evaluation helped spread effective practices. Becker, Edmundo, Nunes, Bonatto, D., & Souza, R. (2004). Empowerment e avaliação participativa em um programa de desenvolvimento local e promoção da saúde. Ciência & Saúde Coletiva, 9, 655–667. Bodstein, R., Zancan, L., Ramos, C. L., & Marcondes, W. B. (2004). Avaliação da implantação do programa de desenvolvimento integrado em Manguinhos: Impasses na formulação de uma agenda local. Ciência & Saúde Coletiva, 9, 593–604. Cabrera-Pivaral, C. E., Mayari, C. L. N., Trueba, J. M. A., Perez, G. J. G., Lopez, M. G. V, Figueroa, I. V., et al. (2002). Evaluación de dos estrategias de educación nutricional vía radio en Guadalajara, México. Cadernos de Saúde Pública, 18, 1289–1294. Carrasquilla, G. (2001). An ecosystem approach to malaria control in an urban setting. Caernos de. Saúde Pública, 17(Suppl), 171–179. Cheadle, A, Beery, W. L., Greenwald, H. P, Nelson, G. D., Pearson, D., & Senter, S. (2003). Evaluating the California Wellness Foundation’s health improvement initiative: A logic model approach. Health Promotion Practice, 4, 146–156. Chiaravalloti, V. B., Morais, M. S., Chiaravalloti Neto, F., Conversani, D. T., Fiorin, A. M., Barbosa, A. A. C., et al. (2002). Avaliação sobre a adesão às práticas preventivas do dengue: O caso de Catanduva, São Paulo, Brasil. Cadernos de Saúde Pública, 18, 1321–1329. Chrisman, N. J., Senturia, K., Tang, G., & Gheisar, B. (2002). Qualitative process evaluation of urban community work: A preliminary view. Health Education & Behavior, 29, 232–248. Conrey, E. J., Frongillo, E. A., Dollahite, J. S., & Griffin, M. R. (2003). Integrated program enhancements increased utilization of farmers’ market nutrition program. Journal of Nutrition, 133, 1841–1844. D’Onofrio, C. N., Moskowitz, J. M., & Braverman, M. T. (2002). Curtailing tobacco use among youth: Evaluation of Project 4-Health. Health Education & Behavior, 29, 656–682. Figueiredo, R., & Ayres, J. R. C. M. (2002). Intervenção comunitária e redução da vulnerabilidade de mulheres às DST/Aids em São Paulo, SP. Revista de Saúde Pública, 36(4 Suppl), 96–107. Figueroa, I.V., Alfaro, N. A., Guerra, J. F., Rodriguez, G. A., & Roaf, P. M. (2000). Una experiencia de educación popular en salud nutricional en dos comunidades del Estado de Jalisco, México. Cadernos de Saúde Pública, 16, 823–829. Hawe, P., Shiell, A., Riley, T., & Gold, L. (2004). Methods for exploring implementation variation and local context within a cluster randomized community intervention trial. Journal of Epidemiology and Community Health, 58, 788–793. Kelly, C. M., Baker, E. A., Williams, D., Nanney, M. S., & Haire-Joshu, D. (2004). Organizational capacity’s effects on the delivery and outcomes of health education programs. Journal of Public Health Management Practice, 10, 164–170. Kim, S., Koniak-Griffin, D., Flaskerud, J. H., & Guarnero, P. A. (2004). The impact of lay health advisors on cardiovascular health promotion using a community-based participatory approach. Journal of Cardiovascular Nursing, 19, 192–199. Lantz, P. M., Viruell-Fuentes, E., Israel, B. A., Softley, D., & Guzman, R. (2001). Can communities and academia work together on public health research? Evaluation results from a community-based participatory research partnership in Detroit. Journal of Urban Health, 78, 495–507. Lima-Costa, M. F., Guerra, H. L., Firmo, J. O. A., Pimenta, F., Jr., & Uchoa, E. (2002). Um estudo epidemiológico da efetividade de um programa educativo para o controle da esquistossomose em Minas Gerais. Revista Brasileira de Epidemiologia, 5, 116–128. MacLean, D., Farquharson, J., Heath, S., Barkhouse, K., Latter, C. & Joffres, C. (2003). Building capacity for heart health promotion: Results of a 5-year experience in Nova Scotia, Canada. American Journal of Health Promotion, 17, 202–212. Markens, S., Fox, S. A., Taub, B., & Gilbert, M. L. (2002). Role of black churches in health promotion programs: Lessons from the Los Angeles mammography promotion in churches program. American Journal of Public Health, 92, 805–810. McElmurry, B. J., Park, C. G., & Busch, A. G. (2003). The nurse-community health advocate team for urban immigrant primary health care. Journal of Nursing Scholarship, 35, 275–281. Moody, K. A., Janis, C. C., & Sepples, S. B. (2003). Intervening with at-risk youth: Evaluation of the Youth Empowerment and Support Program. Pediatric Nursing, 29, 263–270. Naylor, P-J., Wharf-Higgin, J., Blair, L., Green, L. W., & O’Connor, B. (2002). Evaluating the participatory process in a community-based heart health project. Social Science & Medicine, 55, 1173–1187. Nuñez, D. E., Armbruster, C., Phillips, W. T., & Gale, B. J. (2003). Community-based senior health promotion program using a collaborative practice model: The escalante health partnerships. Public Health Nursing, 20, 25–32. Quinn, M. T., & McNabb, W. L. (2001). Training lay health educators to conduct a church-based weight loss program for African American women. The Diabetes Educator, 27, 231–238. Reininger, B. M., Vincent, M., Griffin, S. F., Valois, R. F., Taylor, D., Parra-Medina, D., et al. (2003). Evaluation of statewide teen pregnancy prevention initiatives: challenges, methods, and lessons learned. Health Promotion Practice, 4, 323–335. Schulz, A. J., Zenk. S., Odoms-Young, A., Hollis-Neely, T., Nwankwo, R., Lockett, M., et al. (2005). Healthy eating and exercising to reduce diabetes: exploring the potential of social determinants of health frameworks within the context of community-based participatory diabetes prevention. American Journal of Public Health, 95, 645–651. Stewart, A. L., Verboncoeur, C. J., McLellan, B. Y., Gillis, D. E., Rush, S., Mills, K. M., et al. (2001). Physical activity outcomes of CHAMPS II: A physical activity promotion program for older adults. Journal of Gerontology: Medical Sciences, 56A, 465–470. Williams, J. H., Belle, G. A., Houston, C., Haire-Joshu, D., & Auslander, W. F. (2001). 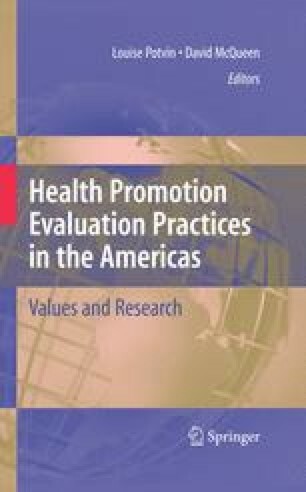 Process evaluation methods of a peer-delivered health promotion program for African American women. Health Promotion Practice, 2, 135–142.